Lobsang is a former Tibetan Buddhist monk and studied Buddhism for over 25 years. He holds a Geshe Ngarampa degree (degree is equivalent to a PHD degree in western colleges and universities) from the Gyudmed University in Buddhist Philosophy, Ritual, and Tibetan spiritual and traditional Arts. Since a very young age, Lobsang learned traditional Tibetan sculpture, painting, the fine art of sand painting (sand mandalas), as well as creating butter sculptures for ceremonies and rituals. He has practiced these traditional arts for a long time, and now he offers classes for children in contemporary air dry clay sculptures. 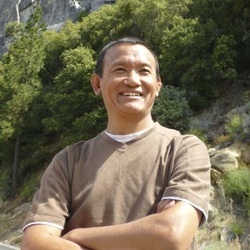 Lobsang has been giving mindfulness and meditation class at Santa Clara County Elmwood Correctional facilities and other locations in SF bay area. Additionally, Lobsang has dedicated much time and effort into learning Tibetan Medicine, including Kun Nye, the ancient Tibetan physical therapy. He wants to bring the ancient practice of Tibetan wellness to the modern world. Lobsang believes it is important to preserve the beauty of his culture as a true art of living, bringing body, mind, and soul into a natural balance through peace and happiness. As the founder of Tibetan Living Communities, Lobsang, with the assistance of monks from Gyudmed Monastery and support from American friends, created a 501(c)3 nonprofit organization dedicated to the improvement of education and health care for Tibetans. Along with donations from a variety of sources, funds have been raised during tours in the US and Russia made by monks from Gyumed Monastery. Over 95% of the funds have been spent on a variety of projects benefiting the Tibetan people in Tibet and India.